It is just starting to be possible to write about the airline SWISS as you would about any other airline. But the immense shock of its moment of birth still appears as the ghost at the banquet: the sudden grounding on 2 October 2001 of Swissair, one of the most esteemed airlines in the world, that left thousands of travellers and hundreds of flight crew and dozens of aircraft stranded around the world. Bankruptcy is an inherent, necessary and healthy part of capitalism. At some point the only way forwards is to send in the carrion feeders to perform their ceremony of cleansing, clearing the ground for a new start. But what a bankruptcy that was! It was utterly unexpected by most people – the decline that led up to it had been shielded for years from prying eyes and the warning signs ignored or made light of. From the moment of the grounding, people from all over the world were seriously inconvenienced in their daily business and their future planning. In itself bad enough, but the catastrophe also had the Swiss name and the 'Swissness' brand all over it. Not only did an airline hit the deck that day (to use aviator slang), but the main Swiss transport hub in Zurich looked now to have no future and with it the economic life of the region – including a large swathe of southern Germany – would have to take a massive hit. It is a sign of the magnitude of the shock that the word 'Grounding' probably entered into the vocabulary of even the most obscure dialect of the remotest mountain farmers in Switzerland. Switzerland's international reputation for prudent management and financial solidity seemed to have been damaged, but in retrospect it is possible to argue that the handling of the issue showed great financial maturity. The response was measured: the political willpower in particular was strong enough to resist the temptation to throw public money at the disaster, which would have had the inevitable result of transforming it into a long-running catastrophe involving the lamest of lame ducks. The old saying applies: the first cut is always the cheapest. Despite the high emotions and the missiles coming from all directions, those involved kept their heads. The airline we now call SWISS arose from this catastrophe in a project called, appropriately enough, 'Phoenix'. The perils of the collapse of Swissair were great, but the response showed just how great the efforts of government, the financial services and business sectors to those perils could be. After six months of frantic behind the scenes work the first flight of the new airline took place on 31 March 2002, from Basel to Zurich. The major problem proved not to be the financial and practical logistics of restarting an airline, complicated though they were, but integrating the staff from the rubble of Swissair into the existing structures of Crossair, which was used as the basis of the restart. The idea that companies had 'organizational cultures' had become a hot-button management topic after the 1960s – the creation of the new airline SWISS out of the two very different cultures of Crossair (short hop, budget) and Swissair (long haul, premium) was a textbook management nightmare that dogged the emergence of the new airline for nearly a decade. But project 'Phoenix' – SWISS – arose from the ashes and through the smoke and distractions of its early years to become a profitable airline, finally taken under the wing of the mighty Lufthansa. The latest miracle is that, even under that broad wing, it has managed to keep its identity and a large measure of independence, a situation for which both partners, Lufthansa and SWISS, have to be praised. In 'SWISS - Die Airline der Schweiz' Werner Vogt has demonstrated a mastery of his brief and an ability not only to keep this story on track through all the dramatic events of the last two decades but to make it as interesting as a detective novel. There are also interviews with many of the major participants in the story which are fascinating in themselves. Unfortunately, the book is only available at present in German. The story of disaster and rebirth will take the reader halfway through the book. The second half is an equally readable account of the modern airline and the complex environment in which it has to operate – a look behind the scenes, as it were. The entire logistical basis and the training that makes it all work are presented in stories that are accompanied by remarkable photography. An interesting aspect of the period covered in the second half is the way that all the changes that went into the creation of SWISS were running in parallel to a period of immense changes in air transport itself: competition among budget airlines, new destinations, environmental impacts and a tremendous expansion in capacity. The development of SWISS was in practice a development towards a moving target, a fact that makes the management performance even more remarkable. The book has been generously produced, with a good, readable and reasonably sized typeface and many excellent illustrations. The illustrations are also sourced and captioned well, an example of the care that has obviously been taken in writing and producing this book. The narrative sets a cracking pace and never relents. It is the pace and the reader's resulting engagement with the story that leads to a criticism of the layout of the book. Embedded in the narrative are sections of sometimes several pages that contain interviews with the principal participants. These interviews are an interesting feature of the book, but the way they are embedded into the narrative sometimes causes the engrossed reader to stumble. For example, the reader is rattling along nicely, gets to the last line on page 39 '...In dieser Grundstim-' …and? …?? Unfortunately, the remainder, 'mung konnte…', is four pages away, at the top of page 44. When you look closely there is a little arrow and 'Seite 44' in what seems to me to be a four-point font. A similar situation occurs on page 53, '…Fusion oder Übernah-'. The remainder, 'me gegeben…', is to be found on page 55; this time there is no arrow and reference. Do the interviews really have to pop up in the middle of sentences? Yes, I know, I know… if that is the only thing I can complain about then it must be a very good book indeed. It is – which is my point: in a less interesting book, no one would notice such things, but the narrative does take the reader along with it, meaning that such disruptions in the flow are noticeable. Apart from this glitch it is obvious that a lot of attention to detail has gone into the book. The flight enthusiasts will be grateful for the care with which anciliary information such as timelines and fleet details has been prepared. A good bibliography and name index rounds off the book. All in all, the author is to be congratulated on pulling together a series of extremely complex events into such a readable tale; the publishers, too, on putting the narrative into such a generous and well-illustrated context. 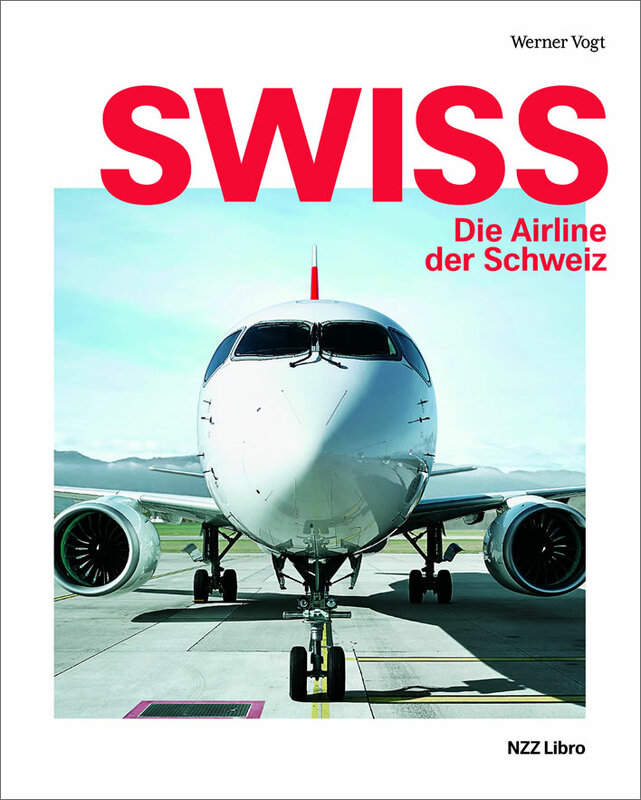 Werner Vogt, SWISS – Die Airline der Schweiz, Verlag NZZ Libro, 212 pages, 257 illustrations, published 31 July 2018, ISBN 978-3-03810-313-4. Available from NZZ Libro.